Box Text: HOW'S THIS FOR LANDING GEAR? Midway's Thunder Racing Series continues with a four-wheel frenzy! Choose from one of four classes of rugged off-road vehicles and watch the dirt fly by at a blistering 60 frames per second! 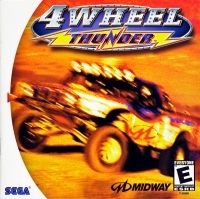 4 Wheel Thunder is the premier all-terrain racing game for the Sega Dreamcast! * 24 incredibly detailed tracks as well as bonus trucks! * Loads of shortcuts and strategic powerups add endless replay value! * VMU compatible to save your progress, replays and upgraded vehicles! * 2-player split-screen racing action! 01-27-2016 lugnut Box Text HOW'S THIS FOR LANDING GEAR? Midway's Thunder Racing Series continues with a four-wheel frenzy! 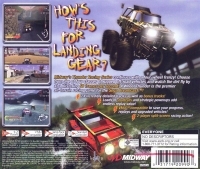 Choose from one of four classes of rugged off-road vehicles and watch the dirt fly by at a blistering 60 frames per second! 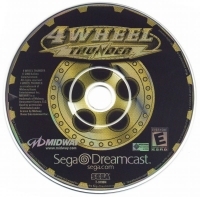 4 Wheel Thunder is the premier all-terrain racing game for the Sega Dreamcast! * 24 incredibly detailed tracks as well as bonus trucks! * Loads of shortcuts and strategic powerups add endless replay value! * VMU compatible to save your progress, replays and upgraded vehicles! * 2-player split-screen racing action! This is a list of VGCollect users who have 4 Wheel Thunder in their Collection. This is a list of VGCollect users who have 4 Wheel Thunder in their Sell List. This is a list of VGCollect users who have 4 Wheel Thunder in their Wish List.